As all 12 Louisiana college teams are currently participating in spring practices, that could mean only one thing and that is the upcoming college football season is approaching near. As we continue to wait the days before fall practice, for the next three weeks, we will recap the National Signing Classes for all 12 Louisiana collegiate football teams. Today, we will recap the National Signing Class for the UL Lafayette Ragin’ Cajuns. The Ragin’ Cajuns have a bright future under Billy Napier. In only his first season leading the program, Napier picked up where Mark Hudspeth left off and that was leading the team to Sun Belt conference relevancy once again by winning the Sun Belt West Division with an overall record of 7-7. Now, with another season, Coach Napier is ready to take the next step and lead the team to a conference championship. With a talented recruiting class such as this year’s, the Ragin’ Cajuns are taking the next step in doing so. 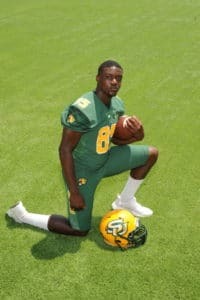 Louisiana Football Magazine’s recruiting expert Lee Brecheen has watched all of the Louisiana high school signees featured below at one point. Whether it is watching full game film or seeing them in person, Brecheen has gotten the chance to see a lot of these signees play. 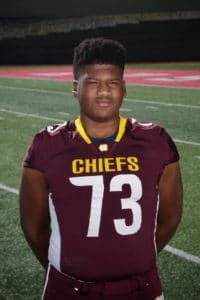 In today’s college recruiting recap, Brecheen takes a dive in the UL Lafayette football program as he gives out his top five talented high school signees, top college transfer, sleeper players to keep an eye on, players that are in an unique position to start right away, and also, his final thoughts on the entire signing class in general! 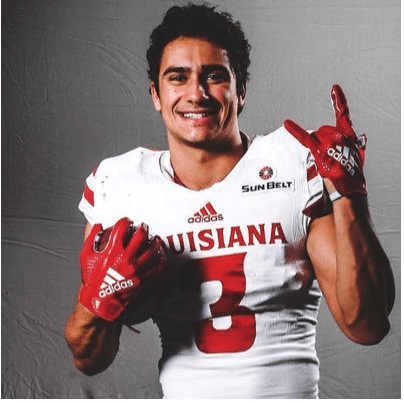 Bio: In the team outlook, Brecheen mentioned that the Ragin’ Cajuns did a good job of picking up guys with high ceilings that flew under the radar, and one of those type players is A.J. Gillie from Natchitoches Central High School. Gillie was very high on his radar even as an underclassmen. 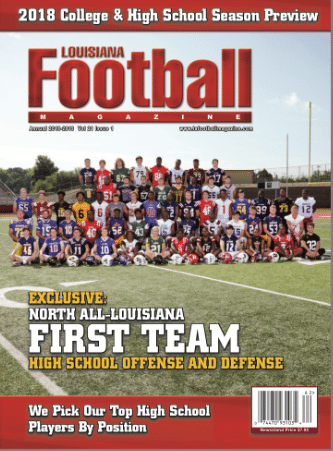 He was so high on Gillie that he actually made the cover of the North Louisiana edition of Louisiana Football Magazine magazine as well as making the 1st Team All-North Louisiana preseason team. 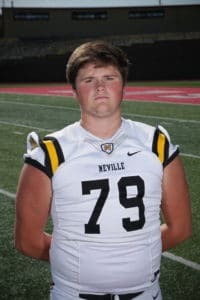 The All-District offensive lineman chose to sign with the Ragin’ Cajuns over other programs such as Grambling State, North Carolina Central, and Army. 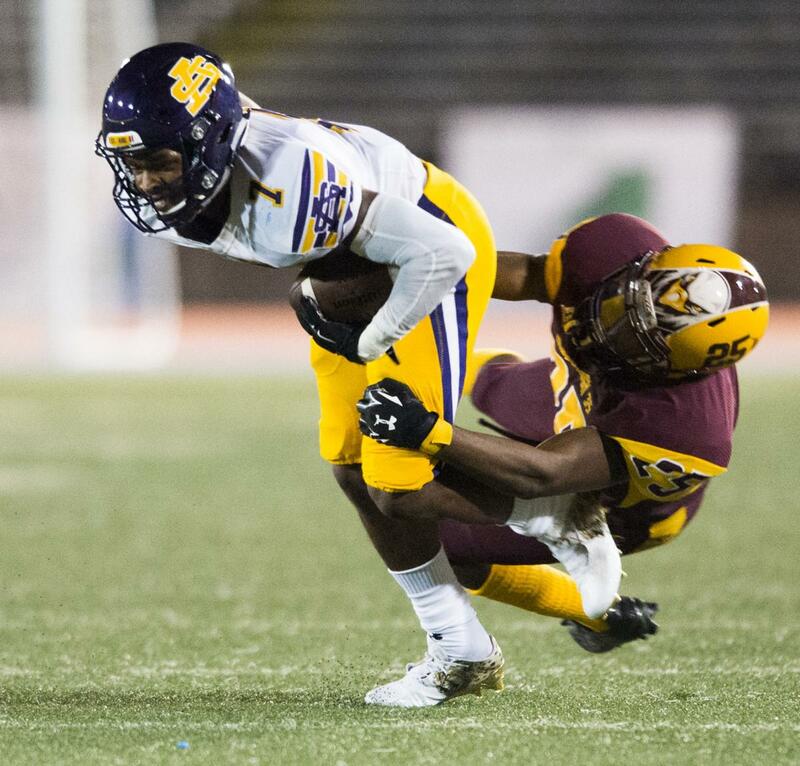 Bio: McDonogh 35 High School in New Orleans, Louisiana is making a strong case for being DB High in Louisiana especially in recent years with the likes of Delvin Breaux (New Orleans Saints), Brad Stewart (Florida), and Joe Foucha (Arkansas). Now, the Roneagles can add another DI player to the list in safety Jaden Henderson. The three star prospect followed in the footsteps of other great players before him by leading the team to the playoffs as a senior. Before signing with the Ragin’ Cajuns, Henderson also considered Indiana, ULM, Louisiana Tech, Troy, Toledo, Texas State, and South Alabama. Bio: Brandon Legendre will come down as arguably the greatest player in the history of E.D. White football. Legendre’s electrifying speed on the field and athleticism drew the attention of Notre Dame, West Virginia, TCU, Kentucky, Arizona State, Vanderbilt, and Utah. However, it was the fit of the UL Lafayette program that drew not only Legendre to sign, but even sign with the team in December. The stats back it up as one of the best offensive playmakers in the state over the last few seasons as the three star playmaker accounted for over 6,000 yards of total offense along with 80 touchdowns. The All-State selection often showed his versatility playing multiple positions including quarterback and kick returner. That asset of his game will be a nice addition to Coach Napier and his staff. 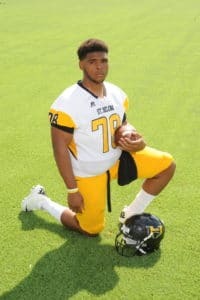 Bio: Not only did O’Cyrus Torrence stick out like a sore thumb during St. Helena football games thanks to his 6-5, 325 pound frame, but his ability also spoke for itself. Torrence, who was the biggest signee of any of the other lineman signees, showed that he has great endurance playing on both sides of the football during games. The two time 1st Team All-District selection was on the front cover of Louisiana Football Magazine’s South edition before the start of the season. 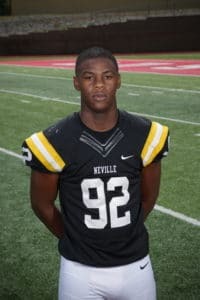 The three star prospect chose UL Lafayette over Georgia, Louisiana Tech, ULM, South Alabama, and Middle Tennessee. Bio: The Kentwood Kangaroos may have been known for its great offensive skill talent, but the team may have never gotten to win two Class 1A state championships without the dominant efforts of senior defensive end Kendall Wilkerson. At 6-4, 275 pounds, Wilkerson was nearly unblockable as a senior when he posted 95 tackles, 10 sacks, and eight tackles for loss. The two time All-State selection received offers from Wisconsin, Kansas, UCF, Southeastern, and Tulane. 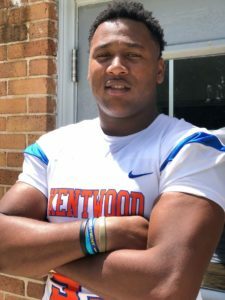 Also, according to Kentwood Head Coach Jonathan Foster, even LSU Head Coach Ed Orgeron showed interest in the three star prospect. In the end, it was Lafayette that felt the most at home for Wilkerson as he signed with the Ragin’ Cajuns in December. 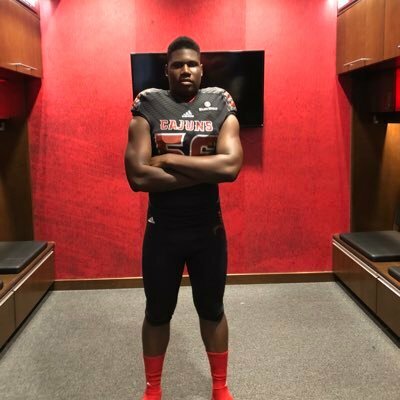 Lee’s Scouting Report: “Even if Kendall Wilkerson does not in fact enroll at the University of Louisiana at Lafayette, I think that he would be a sign back for them after he plays at the junior college level or he will go to another school. Hopefully, he enrolls, but he would be a big time player for the Ragin’ Cajuns. Bio: Like a lot of great Neville High School defenders, senior OLB La’Kamion Franklin dominated the competition. Franklin was a force to be reckoned with before his senior year, but he even broke out even further with a great senior campaign. 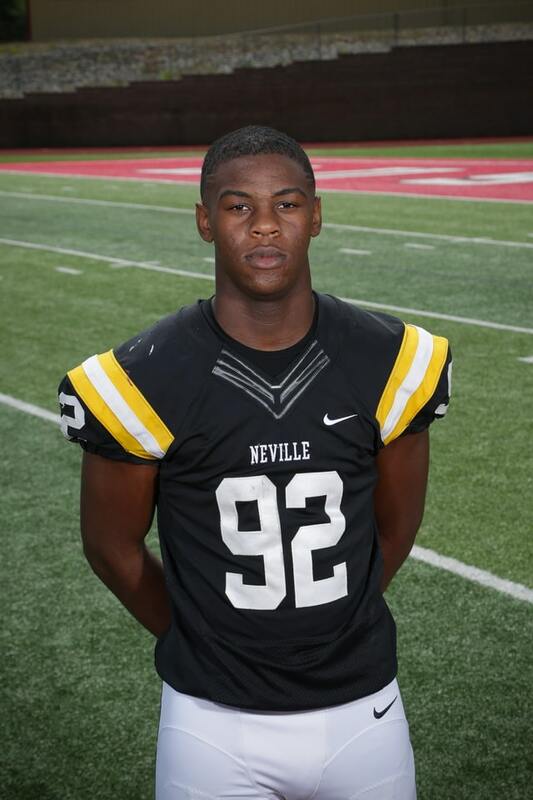 In his final season as a Neville Tiger, Franklin recorded 78 total tackles, 42 solo tackles, 11 sacks, 25 tackles for loss, 14 quarterback hurries, three pass breakups, and one fumble recovery. The three star outside linebacker’s ability to disrupt the opposing passer drew the attention of Arkansas Tech, Louisiana College, Arkansas Monticello, and East Texas Baptist University. However, when the Ragin’ Cajuns offered Franklin, it was too good of a deal to pass up as he signed with the team on National Signing Day. Bio: Like how McDonogh High School is making a name for producing defensive backs, Southern Lab in Baton Rouge, LA is doing the same thing at linebacker especially in recent years with the likes of Christopher Allen (Alabama), Damone Clark (LSU), and now Tyler Guidry. Guidry, along with teammate DE Christopher Welch (Nicholls State), have really flown under the radar compared to LSU signees RB Tyrion Davis and OG Kardell Thomas, but in their own way, dominated other competition. Guidry was in fact the second highest signee according to a lot of recruiting sites for the Ragin’ Cajuns’ signing class. In his senior year, Guidry was a quarterback’s nightmare with 68 tackles, 12 sacks, and a pick six. The three star athlete received offers from South Alabama, SMU, Western Kentucky, ULM, Southern Miss, Rice, Tulane, and Arkansas State before signing with Billy Napier’s squad on National Signing Day. Along with fellow OLB La’Kamion Franklin, they could potentially form a deadly pass rushing linebacker duo. 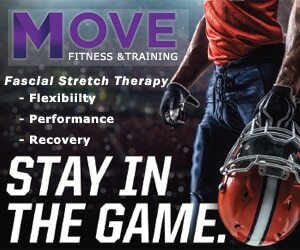 Bio: Whether it has been as a wide receiver or as a defender, Peter LeBlanc was born to be a football player. As a versatile athlete, LeBlanc also was a standout in track and field, but it was football that was the sport for him. LeBlanc played an integral role in leading the Catholic High School (New Iberia) Panthers to a Division III state championship as a junior as well as a Division III state championship runner up finish as a senior. 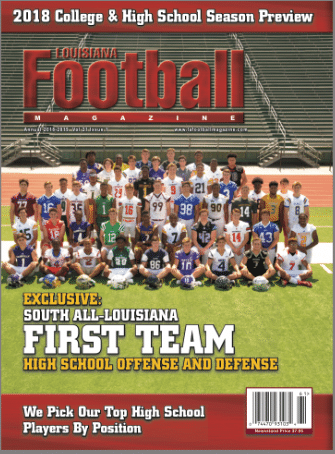 As a junior, LeBlanc, who was on the front cover of our South Louisiana magazine preview this past season, had 36 catches for 793 yards and ten touchdowns. 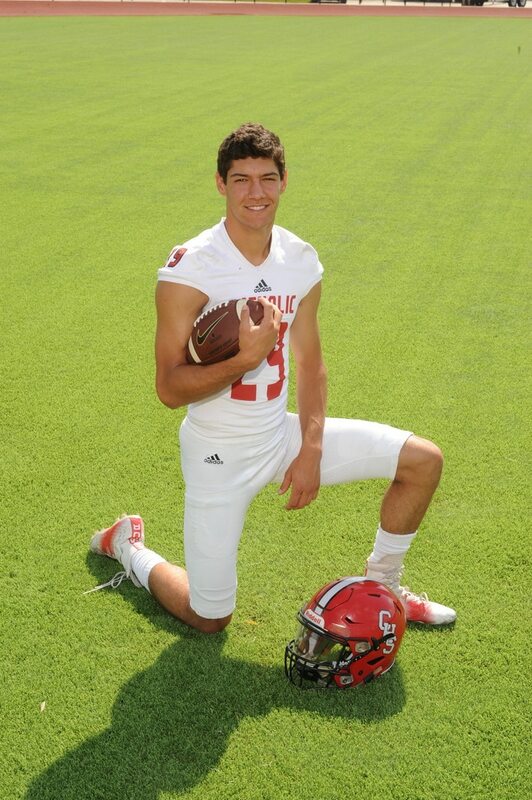 The two time All-District playmaker followed his junior campaign with another strong season in his senior year this time being more heavily used as a runner with 44 carries for 668 yards and nine touchdowns along with 22 receptions for 617 yards and eight more scores as a receiver. The versatile player was also not only a hard hitting defensive back, but also the team’s starting punter as well. LeBlanc’s versatility drew the attention of Louisiana Tech and Nicholls State, but it was the Ragin’ Cajuns that was the best fit for the three star prospect. 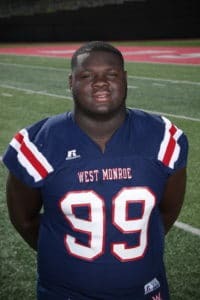 Bio: Whether it was his spending his first couple of years at Wossman High School or spending his last couple of seasons at West Monroe High School, DT Dalvin Hutchinson created havoc in backfields. As an All-State performer, Hutchinson led a dominant Rebel defensive line his senior year, which had four shutouts in the team’s first four playoff games. He was a major reason for the shutouts as he posted 67 tackles, eight tackles for loss, four sacks, and recovered a fumble. There were plenty of instances in which he took over games, and now he will be bringing his ability to Lafayette despite receiving other offers from SMU, ULM, Southern, Memphis, Tulane, McNeese State, Northwestern State, South Alabama, Nicholls State, UTSA, and New Mexico State. Bio: It is clear that Coach Billy Napier and his staff went in-state to bulk up on the offensive and defensive lines. Once again, they got themselves another talented offensive lineman prospect in Logan Newell from Neville High School. Newell, who made the cover of our North Louisiana magazine, was the best offensive lineman on the team the last couple of seasons. The three star prospect chose the Ragin’ Cajuns over other programs including ULM, Texas State, McNeese State, Nicholls State, Northwestern State, and Southern. Bio: The Ragin’ Cajuns did not just fill their needs at the high school level, but also at the junior college level in WR Brian Smith. Smith was once a Louisiana high school product from Barbe High School in Lake Charles, Louisiana. 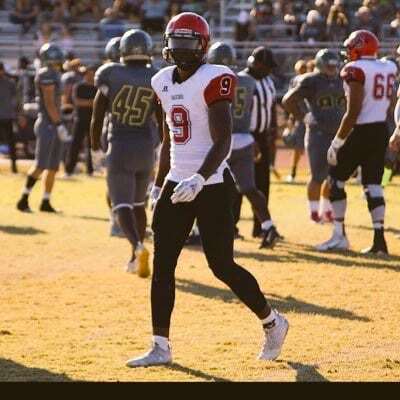 He, then, went to the junior college ranks to Glendale Community College in Glendale, Arizona where he was a two time All-Conference performer combining to have 55 receptions for 868 yards and seven touchdowns in two seasons. Since Coach Napier is familiar with recruiting in Arizona based off his experience as an assistant coach for the Sun Devils along with being the head coach of a Louisiana college team, it made sense for the Ragin’ Cajuns to get this big bodied wide receiver that represents both areas. Bio: Stop if you have not heard this before just reading this recruiting recap, but the Ragin’ Cajuns signed another offensive lineman prospect in Nathan Thomas from Chalmette High School. Thomas was a main reason why the Owls made the Class 5A playoffs the last couple of seasons. He was the best player on an offensive line that made running lanes for a rushing offense that produced over 2,000 yards on the ground and averaged over 300 points a season. Thomas received other interests from other in-state schools such as Northwestern State, McNeese State, and Grambling State before signing with UL-Lafayette. For our recruiting recaps, this is the first time that we had this new section, but based on the fact that the Ragin’ Cajuns are trying to find their starting signal caller for the upcoming year. Whether it is Levi Lewis, Jake Arceneaux, JaI’Ave Magalei, Wesley Blazek, Beau Kalbacher, or Josh Bolfing, it remains to be seen who has or will be taking the job full time, but what is certain is that these two incoming freshmen have a chance to make their mark in the quarterback room. Chandler Fields (5-11, 185), from Archbishop Rummel High School in New Orleans, Louisiana, is trying to make his mark as a freshman just like his predecessor Chase Fourcade did when he came on Nicholls State’s campus. Like Fourcade, Fields may be a little undersized, but he will come down as one of the greatest quarterbacks to ever play at Archbishop Rummel High School. While leading the Raiders to a 9-3 record in Jay Roth’s final season as head coach, Fields threw for 2,359 yards and 30 touchdowns. 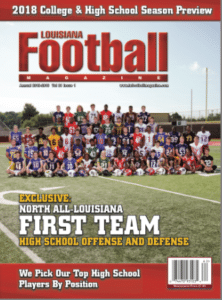 Fields was the sixth UL-Lafayette signee to be featured on the cover of Louisiana Football Magazine joining A.J. Gillie, Dalvin Hutchinson, Peter LeBlanc, O’Cyrus Torrence, and Logan Newell. Fields, who was one of the top quarterbacks in the state this past season, chose the Ragin’ Cajuns over the likes of Memphis, Nicholls State, and Jackson State. Like Fields, Clifton McDowell (6-2, 200) is another highly regarded quarterback in his own state. Coming from Spring High School in Spring, Texas, McDowell was one of the top dual threat quarterbacks in the state accounting for over 3,000 yards of total offense along with 37 total touchdowns. In the season before, he accounted for 31 more touchdowns along with 2,160 more total yards. McDowell chose the Ragin’ Cajuns over the likes of ULM, Texas Southern, Texas State, and Georgetown.